I think all THREE of my pets should be pet of the week, and I'll tell you why. My husband is a Military Police Officer in the US Army and we are stationed in Ft. Stewart, Georgia 3,000 miles away from our home town in California. With being so far away from home, all we had was each other. Not long after we moved, he was put on cycles where he would leave anywhere from a week to a month at a time, leaving me alone... Then Greddy (Siamese boy) found us. He was my only comfort and companion when he was away. He kept me from being so homesick and feeling like I wasn't going to make it way out here. We would water the flowers each morning together, until one morning he slipped away and ran. 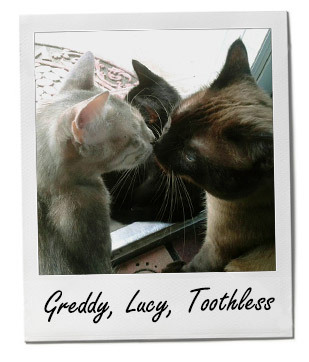 While in the search for him, Lucy found us (grey Tabby). She walked right up to our front door and made herself a little home with us, while we were missing Greddy. Greddy ended up coming back home to us, and met Lucy for the 1st time. They ended up being best friends and having little Toothless, (black girl kitty in the back). A year later, with my husband still leaving on cycles, and working overnight shifts, they keep me from being homesick and away from my family. At times they are my only comfort. They cuddle up with me each night when my husband is gone so I'm not alone. They are pretty much my saviour, and I don't know what I would do without them!